A couple of times this week I got to talk about young people making bold choices. Many years ago Chilean Constanza Godoy Diaz, aka Tanza, decided that simple university studies was not for her, and set up a speed metal band Demona, to follow in her father footsteps. A couple of full length albums which followed a number of EPs, Demona is still kicking, although Tanza now resides in Quebec. Two track 7” EP simply titled 2015 is a testament to that. At first glance raw and commandeering, both songs on 2015 possess a lot of quality and depth. While rawness is absolutely necessary for Demona’s authenticity, the band’s sound never hurts the ears, while a couple of riffs appearing after the 2nd minute mark on Catching the Speed are undeniably catchy. There are definitely traditional metal influences here, and being female fronted, I could even compare Chasing the Speed to the earliest Warlock on Burning the Witches to a degree, but Demona guitars are quite a bit more buzzsaw and grinding. In that regard any fans of blackened and bestial thrash may enjoy 2015 as well. Chasing the Speed has some punky attitude, but Allura Red elevates that direction even further, uncorking fast D-beat and head banging bacchanalia. 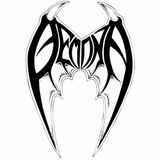 At the risk of sounding sexist, I have seen many Demona fans at many a metal show, they just don't know it. Appearing scuzzy and tattooed, some of the girls I'm referring to are soulful and vulnerable. That is what Demona on 2015 sounds like to me. All crusty and tough on the veneer, but skilled and sensitive at the core.